New Mexico Orthopaedics Associates (NMOA) has opened an After Hours Clinic at their Albuquerque Downtown location. Service is provided by an “Ortho Injury Care Team” Monday through Thursday from 5:00 pm to 8:00 pm. 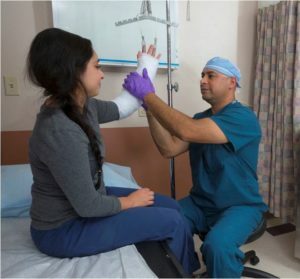 The Ortho Injury Care Team treats patients with unexpected injuries such as strains, sprains, minor dislocations, fractures, and sports injuries. The team includes a certified physician’s assistant, casting and X-ray professionals, and an orthopaedic surgeon. 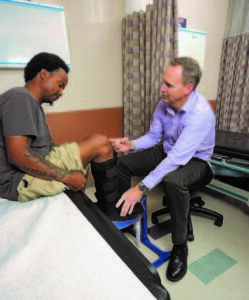 The new After Hours Clinic will allow adults and children with unexpected orthopaedic injuries to be seen by a trained team of orthopaedic medical professionals, without going to an Emergency Room or an Urgent Care center. After Hours Clinic patients that need follow up such as surgery or physical therapy also have the option for treatment at the NMOA surgery center or one of four NMOA physical therapy locations, so that their entire case can be coordinated within one practice. Founded in 1987, New Mexico Orthopaedics is an independent physician group that concentrates solely on the diagnosis and treatment of musculoskeletal injuries and degenerative conditions. The most qualified and highly trained muscular skeletal specialists provide both surgical and non-surgical treatment options for patients. The group’s comprehensive care model integrates the diagnosis, treatment and rehabilitation of orthopaedics, sports medicine and spine care within in one practice. Patients have a choice of several care locations; in Albuquerque with a downtown clinic and surgery center, and three separate physical therapy locations as well as a new physician clinic with physical therapy at the NMOA Rio Rancho location. Why Finger Joints Click, Snap, and Pop How Do Broken Bones Heal?